One Pro-ma Fuel and Oil Additives customer has a 1998 Dodge Caravan with 240,000 plus km that is used as a winter vehicle. Its 3.0 litre V6 runs like a charm - a real powerhouse - except for the fact that it smokes like the chimney of a steel factory. They are always first away from the lights because nobody can see that they have changed. They were beginning to worry that they may pull us off the road for environmental reasons. They were fortunate enough to buy a low kilometre motor and transmission that they were about to put it in, however they were forced to use the van for a long distance trip before the engine could be changed. For the first time they were hauling trailer weighing about 1,500 pounds. As they started the van its usual cloud appeared, so they topped off the oil and decided to add a squirt of Pro-Ma MBL Oil Additive. Fifteen minutes down the road, as they were climbing one of the Elora Road hills, they looked in the rear view mirror and saw cars; the road! There was no visible exhaust. After a 250 km drive they did not need to add oil, there was at least 90% reduction in smoke and they completely lost the burnt oil odour. 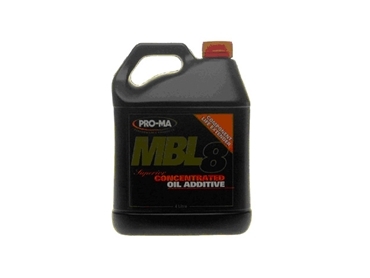 They have since changed the oil and added the proper amount of Pro-Ma MBL8 Concentrated Oil Additive and at this point there is no reason to change the motor, the smoke was the only complaint.